Columbus, Ga. – May 22, 2017. 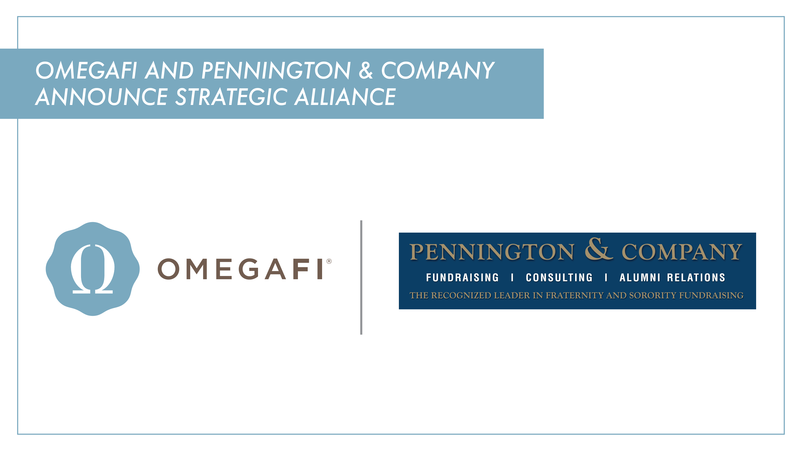 OmegaFi and Pennington & Company are excited to announce a strategic alliance between both companies, bringing an unparalleled level of service to fraternity and sorority chapters, house corporations, alumni(ae) associations, foundations and headquarter entities. Pennington & Company will manage all fundraising activities–leveraging the proven processes and methodologies they have honed over the past 24 years, guiding their clients to reach unrivaled campaign results. These services will be further enhanced by the robust technological tools and fulfillment services of OmegaFi, the pioneer in payment processing and financial security in the fraternity and sorority industry. OmegaFi will continue to focus on enhancing technology and financial operations for fraternal organizations, as well as to provide contributions forms to all Vault chapters and supporting fraternity and sorority foundations using Compass with ongoing training and guidance. Pennington & Company CEO Patrick Alderdice, commenting on the alliance, said, “We look forward to continuing our focus on what we do best: successfully execute fundraising activities that yield unmatched results for fraternities and sororities nationwide. Our partnership with OmegaFi will bring powerful, new resources to the table that we will make available to our current and future clients." The partnership–bringing together the two largest companies working with fraternities and sororities in the US–will focus the 200 employees of both companies on advancing the fraternal movement. At the same time, it will allow both organizations to maintain the integrity of their respective rich histories, principles and values. For more information, please contact Laura Cole at lcole@omegafi.com.